A photo showing the damage to Akashi. On the 9th of June the Kawasaki aircraft company at Akashi was attacked by twenty-six of the Group's planes. Twenty-four ships bombed the cloud-obscured target by radar. Results were poor as later photos showed little damage to the target. Weather proved a greater obstacle than Jap resistance. Two planes bombed the Kochi Airfield on southern Shikoku and returned to the base. 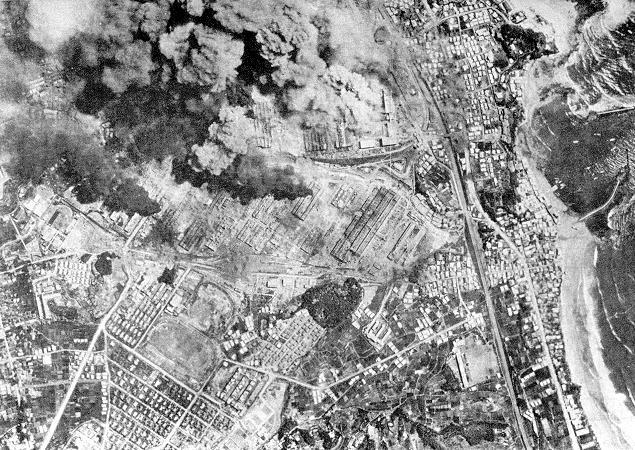 Twenty-four B-29's hit the Kawasaki plant at Akashi; there is 9/10 cloud cover and bombing is by radar; the village of Akashi rather than the plant is hit; two others hit targets of opportunity.